When a knife has as much hype and praise heaped upon it as the Spyderco Paramilitary 2, it’s easy to assume the knife is overrated. We’re here to tell you that it not only deserves all the praise but should get even more. The Spyderco Paramilitary 2 is widely considered one of the most effective and well-designed knives ever made. This has been such a popular model that it’s frequently out of stock around the web because demand is so high. So why is the Paramilitary 2 such a great knife? It starts with the idea of chasing perfection. Spyderco practices something called CQI (constant quality improvement). The original Paramilitary was well done and very popular, but Spyderco didn’t rest on its laurels and updated the design with the 2010 release of the Paramilitary 2. The G-10 handle ergonomics were improved, the profile was thinned, jimping was included, and a Bushing Pivot System was added for a more fluid opening action. And those are just the additions. The knife boasts a 3.438-inch leaf-shaped blade made from high-quality CPM S30V steel. With a strong tip and a full-flat ground blade, the PM2 performs like few others. The knife also features the ambidextrous Round Hole to engage the blade quickly and smoothly with a single hand. Its G-10 handles are grippy yet comfortable, melding perfectly with your hand. The Compression Lock is easy to use while providing extreme lock strength under the most intense situations. On top of all that, the PM2 includes a four-position pocket clip and a larger lanyard hole for extra customization. Making something great even better is no easy task, but Spyderco knocked it out of the park with the Paramilitary 2. It’s no wonder why this is widely considered one of the best EDC knives you can get. 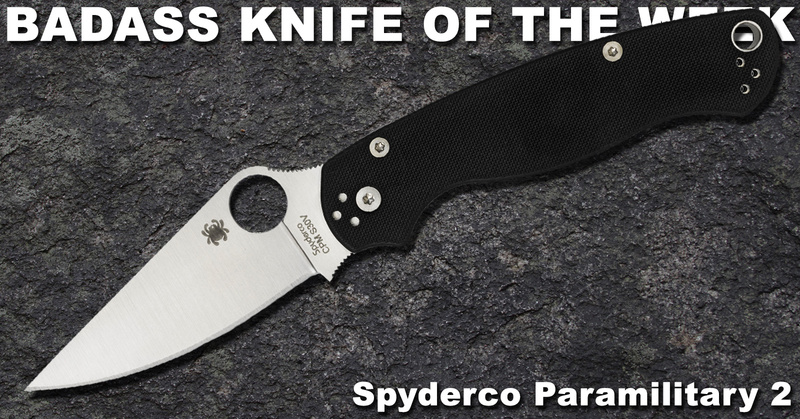 For more information on this Badass Knife of the Week, check out the product page for the Spyderco Paramilitary 2.